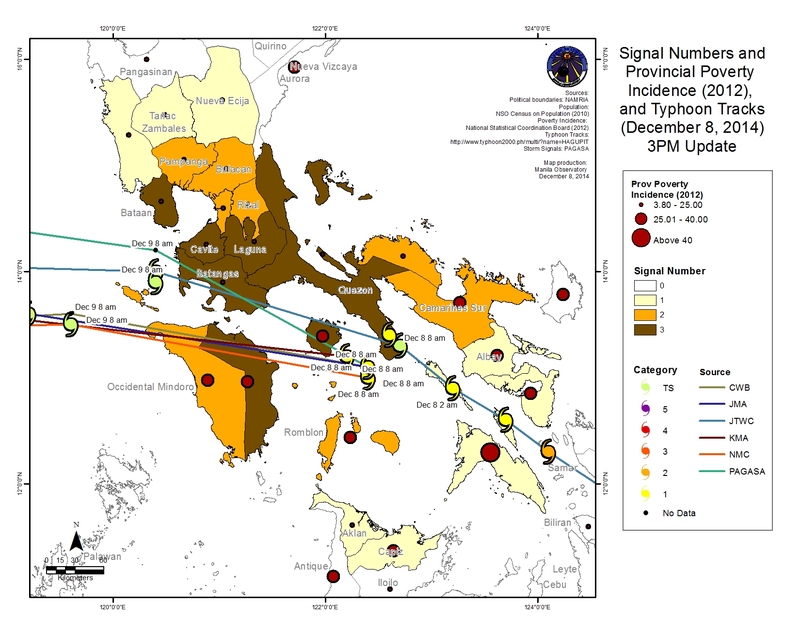 Hagupit moves towards the vicinity of Marinduque, Batangas and Oriental Mindoro (consensus in multi-agency forecast tracks). There are differences in the model forecast on when Hagupit will exit land into the West Philippine Sea. Weakening in the intensity of Hagupit as it crosses the Philippines. Hagupit is now a Tropical Storm with maximum sustained winds of 111 kph (JTWC as of 8 Dec 8 AM). 3.30 PM of 8 December (as of), intense convective activity west of the typhoon center in the areas of Marinduque and Mindoro (MTSAT). (Concentration of solid “pink blob” depicting strong convection) (See Figure 4). 11 AM of 8 December (as of), satellite-based rainfall estimate from TRMM show rain rates of about 15-30 mm/hr, north and west of the typhoon eye (See Figure 5). PAGASA issues the red warning if rainfall is 30mm/hr or greater and continues to be within the next 3 hours. Masbate, Northern Samar and Western Samar received more than 250 mm of rainfall since 6 December (TRMM satellite based rainfall data). More than 110 mm of rainfall fell over Bicol region, Masbate and the surrounding areas for the past 24 hours with more than 170 mm over water (Figure 6). Forecast rainfall (from 8AM Dec 8 to 8AM Dec 9) is more than 170 mm over Quezon, particularly Alabat island (Figure 7, 8a) (GFS Forecast). This is much greater than the average climatological daily rainfall in that area of around 12-14 mm per day (Figure 8b) and the extreme daily rainfall (climatologically, Figure 9), which is about 100-120 mm per day. 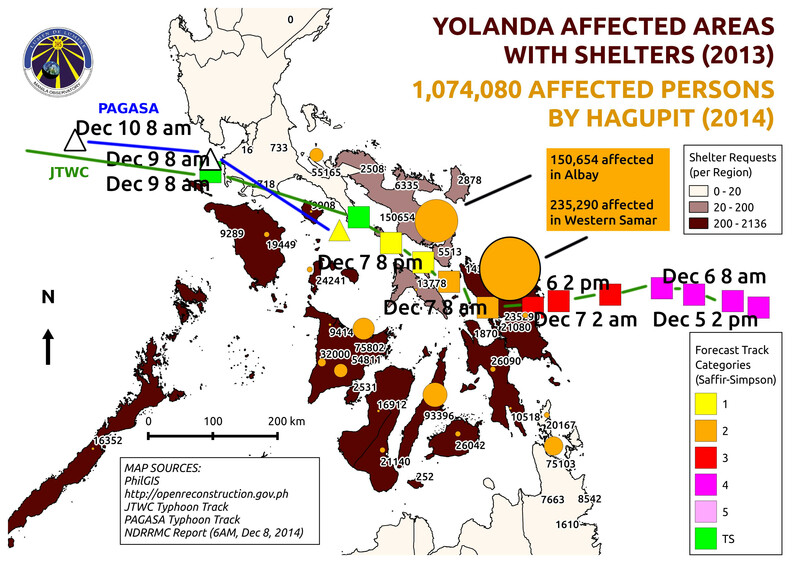 Some of the areas hit by Hagupit especially during landfall are areas that have been severely affected by Yolanda and where shelter requests were high in 2013. 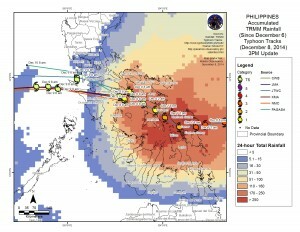 These areas currently have a high number of evacuated persons according to the NDRRMC report as of 6 AM, Dec 8. Samar and Albay have the highest number of persons affected by Hagupit (Figure 16).